Sound brings large scale trains to life. Without it, the illusion of a real railroad is hard to maintain. Just the sound of the whirring and whining of gears just doesn't cut it. Some sort of quasi-realistic sound is necessary. The better the sound quality, the better the illusion. Some locomotives come equipped with basic sound, a few with high quality sound, but most come in "stealth" mode with no sound at all except that made by the mechanism. The primary reason for the scarcity of built in high quality sound systems is cost. A really good sound system can cost as much or more than the loco. After market manufacturers have recognized the need for sound and have responded. There are several types of after market sound systems available ranging from poor to excellent with cost roughly scaled to match quality. There are two major technologies used to create locomotive sounds for large scale trains, analog and digital. In general, analog systems are less expensive. Digital systems sound better and have more features. Some large scale locomotives come equipped with some sort of sound, usually analog, however some LGB locomotives come with digital sound. Analog systems generate an approximation of a locomotive sound by synthesis of the sound with analog type circuitry such as noise generators, mixers, oscillators, limiters and amplifiers. Some of the steam systems don't sound too bad (at least for the exhaust chuff), however, diesel analog systems usually leave a lot to be desired. Digital sound systems usually operate by playback of actual recordings of real engines. The recordings are digitized and stored in a ROM in the sound system. A microprocessor reads back the digital recording and recreates the original sound. Sometimes, a recording can be modified on the fly, for example to stretch out a whistle sound, change the rate of a bell sound, or change the pitch of a diesel engine sound. Most sound systems are "polyphonic." This means that they can play back more than one sound at a time so that one sound will not interrupt another. The worst of the digital sound systems are capable of MUCH better sound quality than any analog system that I have heard. The digital systems usually come with more powerful audio amplifiers so that the sounds can be played louder. Some of the systems have such high quality sound that the speaker is the limiting factor in determining how good a system sounds. Most analog sound systems are designed as original equipment to promote the saleability of a loco by advertising that it has sound. However, most of these systems work only marginally well because of manufacturing cost constraints so even though there is sound, it is not often wonderful. Most of the systems also have a minimal feature set and it is generally not possible to remotely control any sound feature of an analog system. There are a couple of analog after market systems as well, but I don't know much about them (OTT and CMS). Aristo Slopeback Tender Steam Fair None None Hiss continues at low level between chuffs. Bachmann Big Hauler and Columbia Steam Fair None None No volume control on earlier versions. Digital sound systems really make sound worthwhile. These systems incorporate a microprocessor to playback, modify and manage the sounds that are recorded in ROM within the unit. There are five major manufacturers of digital sound systems. LGB manufactured sound systems that were provided as original equipment in many of their locomotives. These systems generally have very high sound quality. LGB systems come only with locos and are not available as after market upgrades. Since I do not own any sound equipped LGB loco, I am not well qualified to comment on their individual systems. Phoenix makes a top quality series of after market systems. Their prices are a little high which is the main reason that I don't own many. For completeness, I have included some information on Phoenix in the table below. This information was derived primarily from Phoenix's web site, their sales literature, comments that I have read on the Internet and direct experience with the P5 version. Soundtraxx makes three kinds of digital sound system. The Sierra is a high quality standalone system designed for large scale trains. The Sierra currently comes in steam and diesel versions and there may still be some in distribution somewhere, BUT AS OF SEPTEMBER 17, 2008, THE SIERRA HAS BEEN DISCONTINUED. They also make a series of sound DCC decoders (DSD) that include both steam or diesel sound and DCC motor/function control in one module. With the currently available versions, the motor control functions are too small for large scale use. They also have a sound only DCC decoder (DSX) that is intended to be installed in a DCC equipped or dummy engine that is already part of a DCC system. There is a newer combination DCC motor controller and sound decoder called the Tsunami. These look pretty advanced but I don't have direct experience with them as their motor output power capability is too small for almost all large scale equipment. It would marginally work in a Bachmann Railtruck with a Goose sound but it is currently not a candidate for anything larger. The DSX has a problem that some of the standalone system don't have. It has minimal internal power storage capability so that on short power dips, it drops out with a pop or a click. The Dallee system has some on board charge storage so it handles short outages more gracefully. The Sierra and Phoenix 2K2 systems have backup batteries that, if they are used, make them immune to power outages. Dallee makes systems that are targeted at DCC equipped locomotives, but they can be arranged to work in any track or battery powered loco. Dallee systems are the least expensive of the digital systems. Some of their diesel systems sound pretty good, some terrible. Their steam system is marginal at best. PH Hobbies made basic digital sound systems that was relatively low in cost, but also light in features. The systems sound pretty good but I have had reliability problems with some of them. PH manufactured both the Aristo and USA trains digital sound systems as well as marketing the systems themselves. However, PH Hobbies appears to have vanished from the face of the earth. These systems appear to be no longer available. Digitrax makes small scale sound systems intended for operation under DCC. These are either dedicated sound and function decoders or a sound add on to some of the more recent HO decoders. These systems come with some charge storage so that they do ride over short power interruptions well. However, their sound output level is too low for most large scale use. The are all right indoors, but there is just not enough volume for outdoor usage. QSI is a new entry into the large scale market. They make basically one DCC/sound decoder intended to plug into the AristoCraft DCC socket. There is an add on board that interfaces that decoder and adds screw terminals. However, the one QSI model seems to work in most locos. It is good for 3 amps average current at the motor and has several watts of audio output power. With the proper programming interface, different sound files can be uploaded to change the system from one type of sound to another. This is a highly programmable decoder with more CV's than you can shake a stick at. It also produces excellent sound and is more cost effective than any separate DCC decoder and sound board combination out there. The system will also work, after a fashion, on DC track power but since it doesn't have a battery, it will stop working at very low track voltages. It doesn't need DCC to run however, and will work in battery powered installations. It also accepts input from an AirWire receiver so that it can become the motor controller for a battery/RC installation. Most of these digital systems will generate enough volume to overload most any small speaker and will run much louder than your neighbors will appreciate. There are two areas where most of the digital sound systems fall down a little. One is the maximum chuff rate where individual chuff can be detected, and the other is minimum whistle duration. When the digital systems try to reproduce steam chuffs at high rates, they have a problem. It would seem that the digital systems can generate chuffs that have a finite minimum duration and when the chuff rate gets high enough, the chuffs tend to merge together into a steady roar. Real steam engines shorten their bark as their speed increases (the valves can only be open so long) so that even at high speeds, individual exhausts of steam can still be detected within the roar of the exhaust. The analog systems can sound better at very high chuff rates than the digital systems as the chuffs tend to be more distinct. Digital whistles are usually recordings. Some systems, especially ones that change pitch, usually just play through the recording and terminate it whenever the command is terminated, finished or not. This usually doesn't sound too good. It should be possible to break a whistle or horn into three segments, attack, duration, and decay so that the duration portion could be stretched by playing a short segment over and over. Each whistle blast would be a short attack phase, a variable duration phase and a short decay phase. In practice, it is difficult to seamlessly merge the phases so that there isn't a click or pop during the transition. Still, it should be possible, even if it takes more memory and certainly more sound editing work. The digital sound system makers should work these problems harder, perhaps by modifying their recordings and adaptively changing the recording that is used depending on conditions. Motors have rotating inertia and can roll through short track powered or DCC power interruptions. Unless the sound system as some form of "electronic" inertia, it will sound absolutely terrible on any track powered system as it drops out and restarts at every power interruption. In a battery/RC power system, there is a large on board battery that can keep a sound system running for as long as there is charge in the battery. The system can start up, idle, run, stop and idle again nicely. On DC or PWC track power, no amount of storage capacitance will be good enough. The sound system will simply shut down when the engine comes to a stop. Restarting can take some time depending on what kind of system it is and this is usually a bother too. In this case, the sound system NEEDS a battery. Only the Sierra and the Phoenix 2K2 will do that now so if you run straight track power, your choices are limited. DCC can provide the needed "electronic inertia" if there is sufficient charge storage associated with the sound system. Most systems DO NOT have enough charge storage integrated into them because the necessary capacitor or super capacitor is simply too large. Sometimes, these can be added on, see P5 Tips for an example. A system needs close to a second of carry over to work properly. On a DCC system, there are several makes that work, within limits. Dallee has a low current draw and seems to have enough on board storage to work without help. The Soundtraxx DSX is pretty touchy and there is no easy way to increase it's resistance to dirty track. The P5 can be enhanced fairly easily. The Digitrax SoundBug has an external capacitor wired to it that provides this function. I don't know how the Tsunami handles bad track. The QSI combo sound/motor decoders appear to have large capacitors on board and they handle bad track quite well. dynamic brakes $250 2K2 and P5 are the same basic systems. Each can sense the presence of DCC to provide sound control and commands. Each can be reprogrammed via a PC for different sounds or effects. The 2K2 comes with a battery and charging circuitry to allow operation on regular track powered systems where power is not available all the time. The P5 is intended for systems that have power all the time via DCC or an on-board battery. They both come as "boards" or "kits". Kits have everything needed, boards are usually missing speakers or other stuff that may not be required. Sound volume is weak by large scale standards, but can be boosted, see DSX Tips. Tends to drop out on short power dips. The vast majority of sound systems used in large scale applications are "standalone" type sound systems. That is, they are designed to operate by themselves from regular track power or perhaps battery power. A few types are intended to operate in conjunction with a control receiver or directly from DCC track signals. The better systems include some form of voltage controlled activation of the sound features. Most of them allow some functions to be activated by external switch closures to blow a prerecorded whistle sequence, ring a bell for a few seconds, generate a coupler clank or play back a short radio conversation. I have found these typically track magnet activated sounds to get tiresome and tedious after awhile. 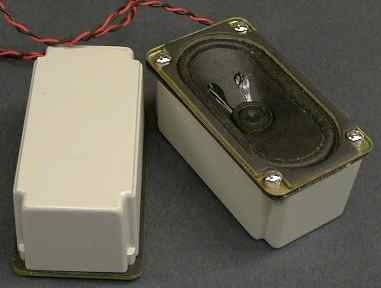 Phoenix and Sierra can sense changes in track voltage to blow whistle signals, but they will only play one recorded sequence. This might be a good sales tool, but from a practical perspective, this gets tiresome too because the things often blow when you don't want them to. Standalone systems can often be wired to accept switch closures from a command receiver or DCC decoder to trigger the same effects, but this isn't very useful either. What is useful are effects that can be activated by remote control when and if appropriate and in an appropriate manner. For example, it is nice to be able to blow a grade crossing when appropriate, and also any other whistle signal when needed, through full control of the whistle function. However, most sound systems, including the best of them, typically do not reproduce a short whistle blast well under remote control. The short signal is either too long (most Sierra and PH systems) or has built in pitch changes (Dallee and some Sierra) that interfere with a normal whistle signal. Simple whistles and horns, such as single chime versions without pitch changes, tend to work better under automatic control than the richer or more complex sounding whistles or horns. Sierra has a good set of automatic effects (two toots for forward, three for backwards, one at stop) that are nice and work well. However to blow a custom whistle signal requires that you deactivate the automatic functions. If you choose to leave the automatic functions active, then the damn thing blows a grade crossing signal at each whistle activation. Further the custom short whistle blast is often too long. The shorter automatic whistles are complete recordings of a short whistle signal and sound better. Dallee systems are designed to be run with a DCC decoder or other command control receiver. Dallee provides no automatic or prerecorded effects, the effect lasts only as long as the command is held so they won't work with track magnets at all. PH typically provides a jumper that changes the response to an external switch closure. The system will either play a prerecorded sequence when triggered, or it will continue the effect for only as long as commanded. Still, the horns and whistles do not reproduce short signals well. The minimum blast is way too long. The Soundtraxx DSD or DSX sound decoders haven't seen too much use in large scale. The DSD decoders which are full up DCC decoders and sound systems combined, are only good for 1.5 amp max, too small for large scale. The DSX sound only decoder works OK, but its power output is just a little light for large scale. I understand that a more powerful version of the DSX is in the works for use in large scale. Because the DSX is a DCC device, it accepts remote commands from the a DCC throttle. The DSX does a credible job at a custom short horn blast, at least for the single chime Wabco horn version. The horn volume, bell volume, engine exhaust and dynamic brake sound volumes can be independently and remotely set. This is a capability that is not available on the large scale standalone systems. However, the DSX can ONLY be controlled from the DCC cab. It will not accept external inputs for sound affects such as coupler clank. If you want it to clank, you have to push a button at the right time. There are no automatic horn or bell effects like in the Sierra, so if you want to sound the horn at all, you have to push a button. The steam version can either chuff from the DCC throttle position or accept a reed switch closure for a synchronized chuff. The standalone systems can often be triggered by function controls of DCC decoders or command receivers. Sometimes, it is possible to directly connect the function output of a DCC decoder and a trigger input of a sound system. Sometimes it isn't possible and some form of isolation (usually a device called an optical isolator) is necessary to interface them. If you ever wondered how it is possible to trigger a sound effect with only one wire connected between a decoder and a sound trigger, the following schematic shows how it is done. The current path for the command is shown in the dark arrows. There really are two connections, the hidden one is back through the track. Since both systems have bridge rectifiers, they have a "virtual" ground in common between them. The internal grounds of the sound system and the decoder are not actually connected, but are at nearly the same potential because they are hooked up the same way. The decoder does not know that the current that its function output is sinking to ground does not come from its own power supply, but instead from the power supply in the sound system. The sound system doesn't know that the trigger signal isn't shorted to its own internal ground, but to the internal ground of the DCC decoder. This trick can work and it is often used, but it can also fail. If your sound system maker hasn't tested his system with the decoder that you intend to use, you may fry one or both of the systems unless you know exactly what you are doing. Also, since the systems rely a virtual ground, there is no guarantee that those two grounds will have exactly the same potential at all times. Even though Dallee claims that their sound system can be connected to a decoder this way, random noise or other transients often interfere and causes their whistle to blow when it should not. However, this problem is easy to fix. If you are not sure about the safety of a direct connection or a direct connection does not work, then use of a cheap device called an optoisolator will make it work. An optoisolator is a device that contains an LED that shines on a photo transistor. Light on the photo transistor generates photo currents in the base of the transistor that act just like current injected into the base, turning the transistor on and making it act like a closed switch. With no current in the LED, there is no light and the photo transistor turns off, like an open switch. There is no electrical connection between the LED and the photo transistor so that no real current can flow between the two, hence creating electrical isolation, while allowing signals to flow "through" the device. The 1K resistor limits the current in the LED to less than 20 mA, enough to get a strong signal through the device without burning out the LED. The output current sinking capability is usually about 10 mA, enough to trigger any sound system. Almost any bipolar or Darlington output optoisolator will work in this application, use whatever you can find in your area. I use devices called the NTE 3040, 3041 and 3044 depending on what I can find. There are many others that are equivalent. The speaker can make or break a sound system. The higher end systems really need a good speaker and a good installation to sound really impressive. I have tested each sound system that I have with a speaker from a stereo system just to see what the system could sound like. The Soundtraxx Sierra can REALLY take advantage of a good speaker. The recordings have a lot of bass in them that adds a lot to the overall sound. The less expensive systems, PH and Dallee, appear to have band-limited recordings so that running them on a very high quality speaker really doesn't improve them much. If you run a loud recording with a lot of bass into a speaker that can't handle the bass, the speaker acts much like a stalled motor. It draws a bunch of current, gets really hot and might burn up both itself and the sound system. To reproduce a good bass signal, the speaker cone must have a fair amount of movement capability as it will have to push a lot of air. It will also need a strong magnet with a long magnetic field so that the moving voice coil does not move out of the constant field region at the extremes of its travel. If it does, the force applied by the coil will diminish and the speaker will start to clip the peaks causing distortion. Further, the voice coil will start to overheat. To generate good bass, the speaker cone will have to be a long throw type. These have a half roll of rubberized cloth as a suspension around the edge and a very soft mount. The cone can be moved quite easily by hand. Ones with ripples in the paper cone that extend to the edge won't work as well as the cone is too constrained. The flat plastic cone speakers also don't do very well at the low end although they will work well in the mid range and high end. Look for a speaker with a big magnet on the back and one where the cone is free to move. These three speakers all have the same cone size, but the ones with the larger magnets sound considerably better, especially at the low frequency end. Generally, a heavier speaker of any given size will get that way be having a larger magnet. Even a good speaker needs an enclosure to operate properly and generate full volume. When the cone moves it generates sound from both sides, but at opposite phase. The sound from the back tends to cancel the sound from the front if they are allowed to mix. The waves that are generated from the back must be prevented from interfering with the waves generated from the front. This is usually implemented by enclosing the speaker in a housing to trap and dump the energy radiated from the back. This isn't the most efficient approach because half of the energy is lost, but it works much better than an unenclosed speaker. If the sealed enclosure is too small, the back pressure generated in the small enclosure will imped the cone movement and also result in lower sound levels. In a much larger housing, it is possible to add a port to the housing to properly tune the response. However, within the size constraints of large scale trains, porting the enclosure is usually not effective, there isn't enough volume available to do it properly. The housing size is not terribly critical, usually one that is big enough to clear the large magnet on the back is big enough, but bigger is somewhat better. A usual tender is big enough. All openings in the speaker enclosure should be sealed as tightly as possible, including the little holes that the wires will come out. The enclosure itself should be stiff so that it won't flex and buzz with the sound pressure generated within the enclosure. Most large scale tenders are molded from heavy enough plastic to work acceptably well as a speaker enclosure. If your enclosure tends to buzz due to inadequate strength, you can partially port it to relieve some of the internal pressure. This will negatively affect the response of the speaker, but then a buzz doesn't sound very good either. In general, the larger the speaker, the better the low frequency sound as large area cones can pump more air. 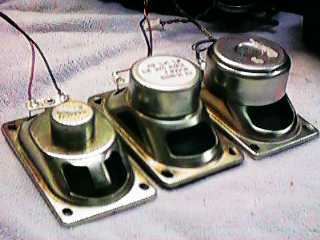 For mounting within an engine or tender, a 3" round or oval speakers like the ones above are all that will usually fit. However, for really good sound, it is effective to haul a trail car with a larger speaker. A 5 x 7 car stereo type speaker can be fit at an angle within a boxcar or stockcar. A triangular shaped housing can be made from 0.062" or thicker styrene or plywood to enclose the speaker so that it can project its sound out an open side door, through the slats of a stock car or through holes drilled in the floor. If the proper speaker plug and jack are used, the speaker can be plugged into an engine such that the speaker internal to the engine will be cut out when the better external speaker is plugged in. Speakers come rated by impedance (in ohms) and power (in watts). The power rating determines how loud the speaker can get before it overloads and distorts. Make sure that your speaker has an equal or higher power rating than your sound system. The impedance rating should be matched to the sound system, usually 8 ohms. Some car stereo speakers are rated at 4 ohms and will overload most sound systems. However, two 4 ohm speakers can be wired in series to make the equivalent of 8 ohms. If you do this, be sure that you wire them in phase or the sound generated by one will tend to counteract the sound generated by the other. Note that connecting two 8 ohm speakers in series will result in LESS volume than one speaker itself will provide. The audio power amplifiers used in large scale sound systems usually approximate a constant voltage source. Wiring two 8 ohm speakers in series results in a 16 ohm load and the total load will draw half the output current resulting in half the total output power. Connecting two 8 ohm speakers in parallel will result in a net 4 ohm load. This load will tend to draw twice the output current and result in twice the total output power IF the power amplifier in the sound system can handle it. Unfortunately, most cannot. They will current limit, distort, overheat and possibly fail. Some Aristo digital sound systems (manufactured by PH Hobbies) have dual power amplifiers and speaker outputs so that the system can legitimately drive two speakers. The systems use a standard stereo power amplifier circuit with only one output normally used. The microprocessor generates several kinds of sounds (engine, horn, bell, brake squeal, cab chatter) which are each routed to one of the two outputs. Normally, a jumper is in place which crossconnects the microprocessor outputs so that all the sounds go to both outputs so that all sounds can be heard on either speaker. If only one amplifier is being used and the engine sound is played very loud, near the full capability of the system, and then the horn is blown, the additional volume of the horn will saturate the single amplifier and cause distortion. On this kind of PH system, a second speaker can be installed (provided room for it can be found) so that the system can be run louder. The two highest energy sounds (engine and horn) are routed to different outputs. If both amplifiers are used and the crossconnect jumper is pulled, the engine and horn sounds will not interfere with each other as they go to different amplifiers. The volume of these two outputs can be independently adjusted. Alternately, if the crossconnect jumper is left in place, the same volume can be obtained by running both outputs at half power each which leaves headroom for blowing the horn. Since finding room for one good speaker in a loco is usually difficult this dual speaker option would probably best be used with an MU pair of engines with the second speaker in the second engine. By leaving the crossconnect jumper in place, the first engine will generate all the sounds at the capability of the single audio power amplifier. When the second unit is connected, its speaker would automatically become active and add to the total volume. Every time that I have installed a new sound system, I have written it up. I do this to document what I did so that I can figure it out later and also to help others along with their own installations. Every installation is a little different so sometimes you'll have to improvise. If you want to see the specifics of the installations, here are links to other pages in my web site with the information. If anybody has written up similar pages, I'll list them here as well if you'd like. This page has been accessed times since May 1, 1999.